David Beckham is a footballer transformed after his time in Major League Soccer. During Paris St. Germaine’s Champions League quarterfinal knockout game against FC Barcelona, European fans got a chance to see what the new David Beckham was all about. Beckham is no longer a right-sided midfielder; his legs gave out three years ago and Galaxy head coach Bruce Arena moved him into a deep defensive midfield role. Beckham’s position on the field was likened several times to a position in the other football; quarterback. Playing centrally and with a pinpoint cross that hasn’t changed a bit, Beckham would swerve the ball onto an onrushing foursome (which included Landon Donovan and Robbie Keane), trying to break defences without coming into contact with them. During Beckham’s time in Europe, he was more combative, taking on fullbacks and delivering those sweet, curving crosses, all the while blasting free kicks and corner kicks like an artillery man on a mission. This same principle was applied, successfully, to a central defensive midfield role; thus, Beckham the right midfielder became Beckham the quarterback, and it’s the position that Carlo Ancelotti put him in against Barcelona, too. It worked well in Los Angeles – Keane and Donovan often capitalized on the chances Beckham created from deep behind the centre line. With David Beckham, the LA Galaxy won two MLS Cups, and enjoyed strong runs in the CONCACAF Champions League, though Toronto FC stopped them from advancing very far in 2012. 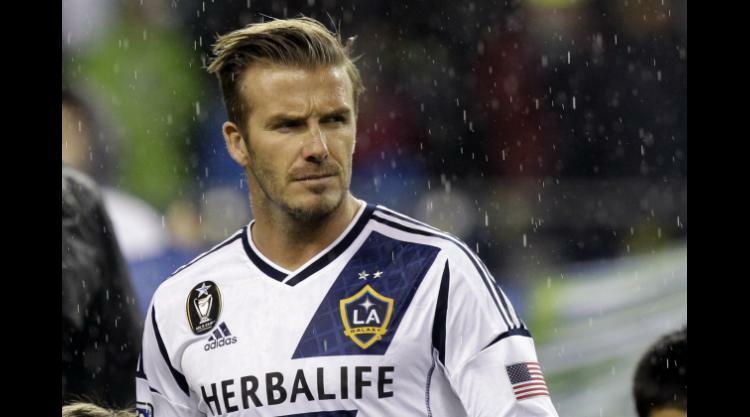 Still, Beckham was instrumental in the offensive prowess of the LA Galaxy. It didn’t hurt that Beckham still hit a mean free kick; Beckham never did lose the ability to “bend it” and he scored a few good goals from outside the box. He even replicated his open goal from behind the midfield line, which was a treat to watch! His fellow midfielder, a Brazilian by the name of Juninho, did much of the defensive work and distributed the ball to Beckham, who would then pick out as accurate a pass as possible. Though Keane and Donovan also scored plenty of goals by their own merit, and the Galaxy’s offense wasn’t purely one-dimensional, Beckham’s contributions to the team made the Galaxy unique. Yet, Keane and Donovan were not the ones who most benefited from Beckham’s passing; it was, instead, an American forward (bearing a slight resemblance to Bradley Cooper from The Hangover) named Mike Magee who found Beckham’s crosses most often and scored from them with consistency. Now, Beckham has Zlatan Ibrahimovic and Ezequiel Lavezzi to pick out, while the LAGalaxy has begun the period of transition to life post-David Beckham. Here’s how they’re shaping up: Firstly, the LA Galaxy traded one of their four main strikers, a forward by the name of Edson Buddle, to the Colorado Rapids. Buddle was, at one point, the top scorer in MLS, but found it difficult to displace Keane in the starting line up. Donovan, who took a bit of a sabbatical before re-joining the Galaxy five games into the 2013 season, will partner up with many familiar faces; Keane, Magee, Juninho, and Beckham’s replacement, another Brazilian midfielder named Marcelo Sarvas. The Galaxy no longer has a quarterback, replacing Beckham’s offensive output with the cohesiveness of both Juninho and Sarvas together in central midfield. Much of the Galaxy’s goalscoring has come from play out wide, with Magee in particular doing well in the opening few games of the season – so far, Magee has scored five goals in six games, leading the league in scoring. In Keane, the Galaxy is placing much of their hopes for a successful 2013 season; last year, Keane scored 22 goals, six behind top goalscorer Chris Wondolowski. Injury issues aside, Keane has never looked out of his element, thriving in MLS the way few European strikers really ever do. There are a few other names the Galaxy depend upon for success, none more so than defender Omar Gonzalez. The centerback has been on an upward trajectory since he was drafted in 2009 and a move to Europe may not be too far away. The Galaxy continue to play their familiar brand of defensively-disciplined football, and Gonzalez is a major component to that style. In terms of shape, the LA Galaxy no longer plays in a 4-1-4-1 formation, moving, instead, to a 4-2-3-1. The only major change in the line-up, besides Beckham’s absence, is the acquisition of a new goalkeeper, Carlo Cudicini, formerly of Chelsea. The one noticeable difference in Beckham’s absence (besides his loving fans in the stands) is in ball direction. The two fullbacks A.J. DeLaGarza and Todd Dunivant do not pass centrally anymore. When Beckham was on the field, he was a magnet, a player that others surrounding him looked to for a pass. It was always interesting to see just how influential Beckham was to the flow of a game, how often he saved one player’s mistake with his touch of experience. That has been replaced with a safer, less risky fullback style; get the ball, pass to the central defender or to the winger, make runs. Beckham’s positional awareness allowed fullbacks to take risks and pass through the opposition’s midfield in order to find him – Sarvas and Juninho simply play a different way. With rumours of Frank Lampard, Ronaldinho and Kaká constantly surrounding the LA Galaxy, it may only be a matter of time before Los Angeles pulls the trigger and signs their next superstar in midfield. However, for now, the Galaxy looks a team comfortable with their identity, playing a strong brand of football and starting the season off well. David Beckham or not, the LA Galaxy are still here to play.